We want to give you the undivided attention you deserve, so our Bridal Stylist works with only one bride at a time. We have so many dresses that we don't have room for them all on our sales floor. Instead, we wanted to make more room for semi-private viewing areas! If you have an appointment, we can show you everything we have that will complete your look for your special day. We want to focus on you and the best way to do that is for us to know you're on your way with the dress of your dreams. One of our expert Bridal Stylists will help you get in and out of our bridal gowns and these gowns aren't like putting on a sun dress! They can be heavy with layers of fabric and many have ties and buttons that you need help with. We will also provide the proper sample undergarments suggested for bridal and formal wear such as slips and bridal bras. We know that you have a lot on your mind with planning your wedding, but please don’t forget to wear underwear for your appointment. So, come in dressed any way you'd like, and come in wearing whatever you don't mind your consultant seeing! Can I just come and check out the dresses? And try them on if I find one I like? Sure! We welcome walk ins and don't want to discourage anyone from checking us out. But we do give priority to those customers that have booked appointments. We’ll do our best to find the next available appointment to accommodate you and your entourage, but in the meantime, you’re welcome to browse what’s on our sales floor. Our appointments fill quickly so we suggest booking 1-2 weeks in advance. Generally, Wednesday thru Friday before 5 p.m. is our least busy time and the best time for walk in customers. We love kids! Don't get us wrong; we have our own. But we also know that they are a distraction not only to you but to other brides around you. We want the complete focus to be on you. We want you and your entourage to enjoy this special time, relax, and not worry about children running about or getting hurt. Do yourself a favor and leave your kids (younger than 12) in good hands so you can enjoy some “ME” time. You don't have to show everyone in the store what you're trying on. A more intimate setting and experience. Check out our video to the left to get a vibe of how your appointment will be. During your appointment your Bridal Stylist will talk to you about your vision: where your wedding is going to be, what styles and silhouettes your liking, and how you met your partner for life and became engaged. We want to know about you! Your Bridal Stylist will focus on your vision and pull gowns that fit your desires or needs. You are the main priority and this is your day! Can I get my dress now? Our on-hand inventory combined, consists of over 700 bridal and formal gowns. Our sizes range from 2-28 in stock, and we can order most of our designer bridal gowns in the size range of 0 to 32. (additional fees may apply to plus or petite sizes). If you want or need a dress now, we can do it. Custom orders are also an option but vary by designer and come with an additional fee. It is very likely that you will need alterations to perfect the fit of your gown. We have that covered with our seamstress Odalis. Odalis is an independent contractor that is there to help. She is in the store every Wednesday and works on an appointment basis. Fittings will take place as scheduled in the Private Room of our salon. Your alterations cost will depend the work and time needed to make it perfect. Alterations are not included in the price of your gown. The cost of alterations is generally determined at your scheduled fitting. Although you are not obligated to have your alterations with us, they are guaranteed. We have 4 experienced Bridal Stylists on board and they're all crazy about bridal and formal fashion in their own way. Take a minute to check them out to the left in their own online video. If you'd like to set up an appointment with someone in particular, we can make that happen. Otherwise, we'll do the matchmaking! I'm a full-figured girl. What do you have for plus-sized brides like me? Embrace those curves because we do! We have in store sample bridal gowns that range in size 16W to 32W. Our formal gowns range in size 16W to 26W. We commit to doing our best to offer a large assortment of choices and alteration options to our full-figured women. We’ll make you feel comfortable and amazing. Because we need to consider those customers that need a dress tomorrow or the next day, we cannot offer holds or lay-away options on in-store merchandise. We know that you are planning for your special day, tuck a little money into your sock drawer here and there to prepare for your big day. We take almost any form of payment except puppies and small children! Cash, check and credit and debit cards preferred! Since most of our dresses are one-of-a-kind, we don't honor returns. In extenuating cases, we can offer an exchange or issue a store credit for equal or greater value (subject to expiration). Is there a more private area than the usual viewing rooms? Absolutely! We have an amazing secluded private area that is devoted to you and your 8-10 guests. This room rents for $75/hour and can be used for your first bridal appointment, returning appointment and/or your “reveal party." We can help you make it an intimate celebration. And while you’re here, we want you to enjoy either a tea and pastry or a sparkling cider and fruit package. No alcohol allowed in the shop, however. Can I get my bridesmaids dresses here? When was the last time you ever heard of anyone wearing a bridesmaid's dress again? Be honest! For that reason, we decided not to sell bridesmaid's dresses in our salon but instead, to connect you to less expensive solutions to dress your bridal party. Tuxes are almost always rented. We can guide you to local and online options that will “suit” all of those in the bridal and/or groom party. Our online option can deliver to anyone, anywhere in the US, which makes the process seamless and perfect. Talk about making it easy! We're doing wedding apparel the way we'd like to handle it. What about coming in several times to try on a dress … just to make sure. That’s fine, but we limit brides to 2 weekend appointments, and then you can make additional ones during the week. We do this because we fill up so frequently on the weekends. It’s not fair to the other brides to keep taking up times when they’d like to bring their guests, too. Click here for more on multiple appointments. Can you help with my other wedding pros? We've been in this business for a long time. We've seen people come and go and we've heard stories - good and bad - on just about everyone. We support our local pros and can provide you the names and directions to our preferred vendors. We also have special nights where you can come in and meet them. We know you don't get married every year, and we'll help. In fact, if you have a question, just email us now on those other wedding pros. What is an Uptown Bride anyway? Being an Uptown Bride is you enjoying a refreshing experience. One that every woman in search of the perfect dress dreams of and deserves. We want it to be a feeling, a community and a relaxed, trusted place. We're here to help you feel special. Where are you again? And how do I get there? Please see the map to the left. You can get directions by clicking on the map itself. Our address is: 2201 Louisiana Blvd. NE, Albuquerque, NM 87110. We're west of ABQ Uptown and south of Coronado Mall, in the same complex as Pei-Wei and across the parking lot from Total Wine. We're open on Wednesday - Friday from 11 a.m. - 8 p.m. Saturday from 10 a.m. to 6 p.m. and Sunday from noon - 6 p.m. Please be aware that holidays and closures may affect our normal hours. What if I don't find my dress with you? We want you to find your perfect dress, even if it's not with us. We will gladly refer you to another local dress shop if you can't find what your dream gown at Uptown Bride. 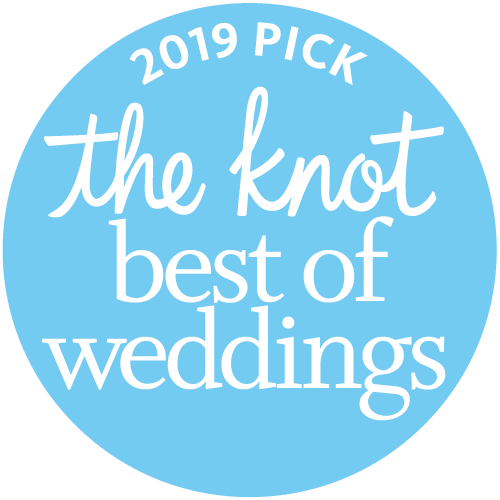 Uptown Bride thinks you deserve more: more choices from among 100s of in-store gowns, ready to wear in days not months; more customer service designed to help, not patronize; and more celebrating your journey. Uptown Bride - None of the Above, and more! Uptown Bride premiering at the NM Wedding Expo in January 2018, introducing our new concept for buying your wedding gown in Albuquerque and New Mexico.